In the olden days, decorating was the wife’s job; real men played golf, watched sports on the telly and stayed out of the kitchen. Clearly those days are over. Real women go to work, real men cook and everybody has a say in decorating. But he likes mid-century modern and she wants comfort and warmth. Holy smokes! What do you do? You compromise and together you create your own signature look. 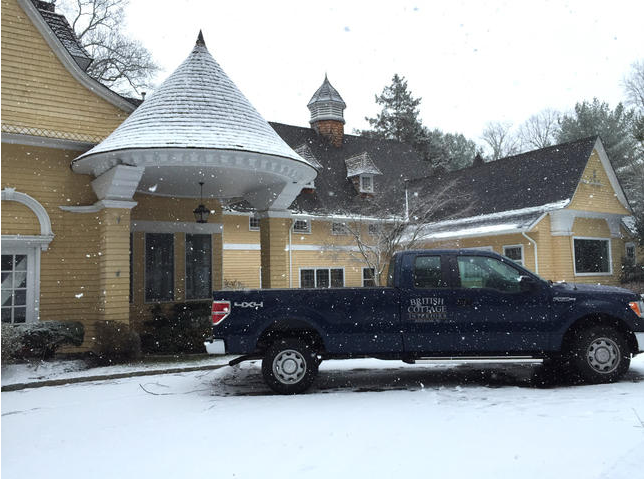 Take, for example, this Rumson carriage house. When the new owners took possession they brought with them the husband’s significant modern art collection and his design sense which was perhaps a bit formal, while the wife was angling for an up-dated, yet comfortable, elegant, yet child-friendly end of the spectrum. First thing they did was transform what had been a formal living room into a lively gallery of amazing art, complemented by a modicum of seating. The idea was to marry comfort with spare and sleek. They wanted room where the art could shine, adults enjoy a cocktail and their three children to romp–the walled off living room, like husbands who don’t decorate, a thing of the past. For a while it was perhaps it was a bit too stark but once they replaced a burnished hunk of copper coffee table with this painted wooden table from British Cottage the living room finally came together. The modern, copper coffee table that was in the living room happily found a new home in the family room where it compliments the metal work on the fireplace and anchors the massive leather couch. 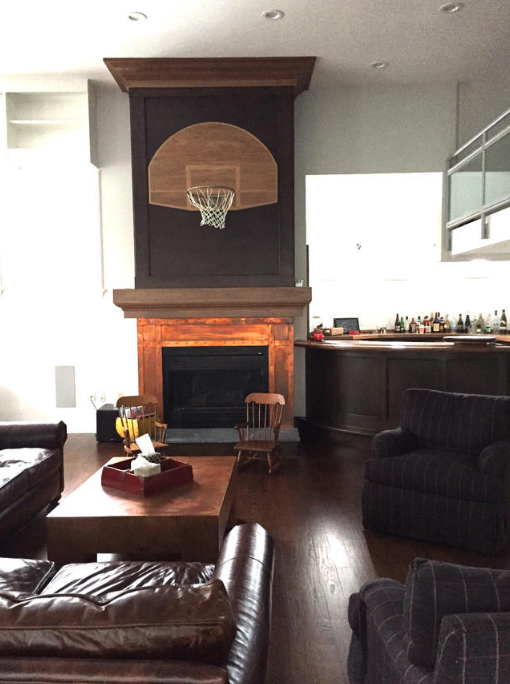 (I’m not sure whose idea was the basketball hoop over the fireplace in the family room–we would have loved this when we were kids). 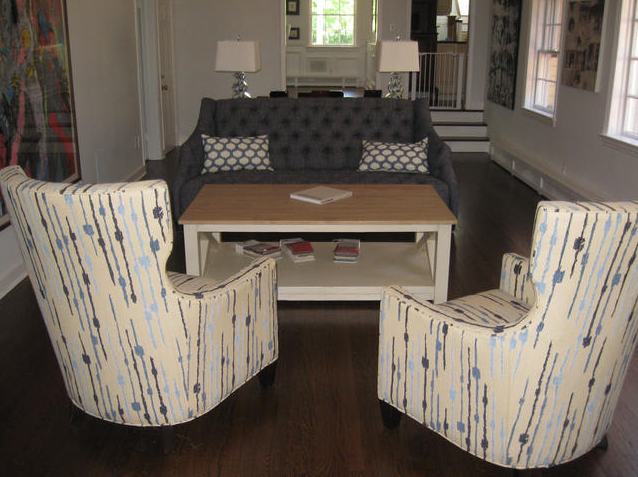 They added a couple of custom Hickory White side chairs in navy plaid from British Cottage that swivel so you can either have a conversation or watch the game on the television on the wall opposite the couch. Perhaps my favorite room is the dining room. They kept the previous owner’s chandelier–from the days when the house was decorated in an over-the-top chateau style–and it looks pretty and romantic. The husband was quite sure how he wanted the custom British Cottage table to look, striking and vibrant in dark oak which works beautifully with the linen-like but really Sunbrella slipcovered sidechairs chosen by his wife. The plain white walls and woodwork were a bold choice in this time of paint the world fifty shades of grey but it really lets the art and the architecture shine. We’ve been making house calls to this home for the last couple of years and every time we go it looks better and better. I think every nook and cranny has engaged the attention of both spouses and each has allowed the other their vision creating a lovely, family friendly home in the process. Not easy.